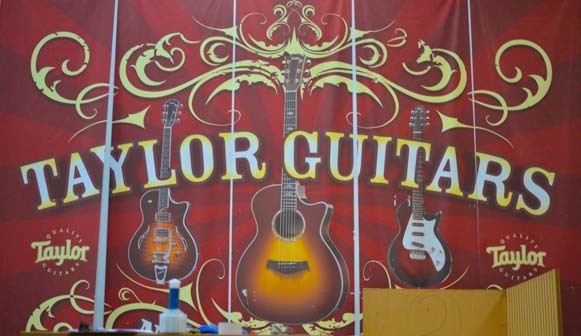 Taylor Guitars Factory Tour - Awe-inspiring!! Mid-November, 2013 – After watching the 2013 Baja Ha-ha fleet of boats sail south for winter cruising in Mexico, we turned our attention away from the sea and back towards the fun things there are to do on land in southern California. Mark has been an avid guitar player since his teenage years, and it wasn’t long before we found ourselves at the unique Taylor Guitars factory in El Cajon. 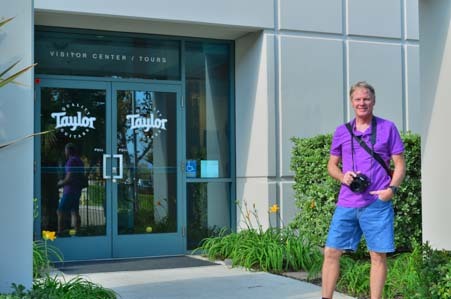 Many moons ago, Mark had taken an impromptu tour of the old Taylor factory, back when it was in Santee, California. How cool to see factory workers walking around with guitar parts in their hands! 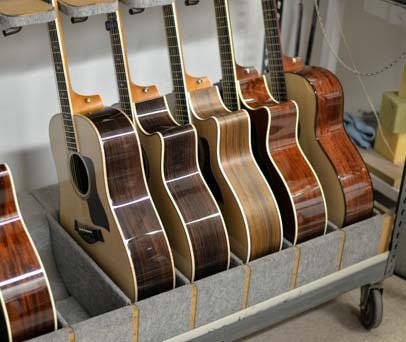 Today the plant is in El Cajon, and the daily tours are not only extraordinarily professional and informative but reflect the high quality standard that is the very essence of Taylor Guitars. What fun it is to pull into an industrial area full of factory buildings and see plant workers walking around carrying guitar necks and bodies! 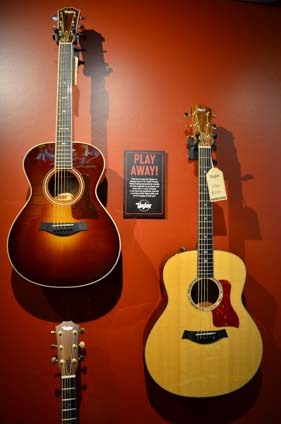 The visitors center was like a museum that hums a melodious ode to the beauty of Taylor guitars. Signs on the walls next to expensive guitars say, “Play Me!” and the receptionist encouraged us to take any guitar we wanted off the rack and give it a strum. Mark happily obliged! Turning a corner into the stylish gift shop, we heard snippets of classic rock favorites coming from the guitars of other tour takers as we milled around and waited for our tour to begin. There were some really great guitar players with us on tour that day! Emerson Lake and Palmer’s “From the Beginning” and Zeppelin’s “Stairway to Heaven” wafted through the room, while the players grinned with delight at the way these graceful guitars sounded. We were given headphones and receivers so we could hear the tour guide over the noise of the factory, and we all assembled at the appointed hour. We gather around our tour guide, wearing headphones, receivers and safety glasses. We were a group of about 20, with just four women present. What a surprise it was to find out from our guide that our group was only “medium” sized. This tour is given every weekday!! I’m sure that being a Guitar God was something all these guys around me had dreamed of at one point or another in their lives, but on this tour we were introduced to the life works of a REAL Guitar God. Not Jimi Hendrix or Eric Clapton or Eddie Van Halen, but the one and only Bob Taylor, the co-founder and visionary behind Taylor Guitars. We soon discovered that Bob’s unique talents and can-do approach to life were apparent when he was just a junior in high school in the early 1970’s. 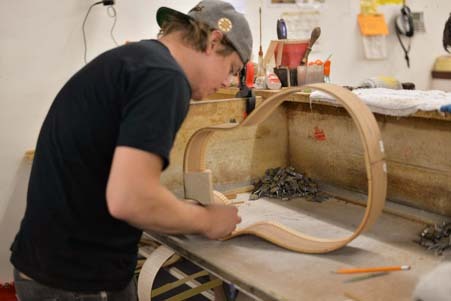 When he saw the $175 price tag of a coveted guitar, rather than go mow a few lawns to raise the capital to buy it, he decided to make one himself in shop class instead! While his shop teacher was teaching the other kids the names of the tools in the shop and explaining what goes into a design plan, he drew up a plan for a 12-string dreadnought guitar and asked his teacher if he could skip the beginner stuff and get right into building his guitar. His teacher gave him a book on guitar building, and by the end of high school Bob had built not just that first 12-string but two other guitars as well. 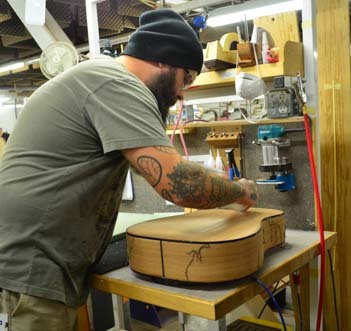 In the process, he had discovered his life’s passion: building guitars! It is hard to imagine knowing what you want to do with your life at age 18, but Bob knew without a doubt. He didn’t want to play guitar or collect fine guitars. He wanted to make them! 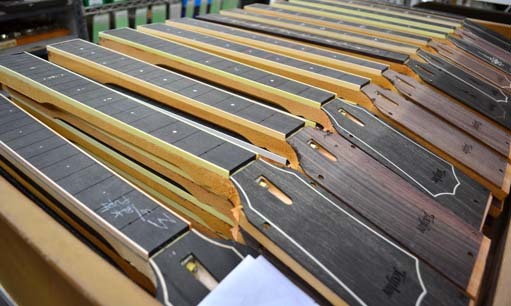 Unused rosewood scraps are sent to ukelele factories! 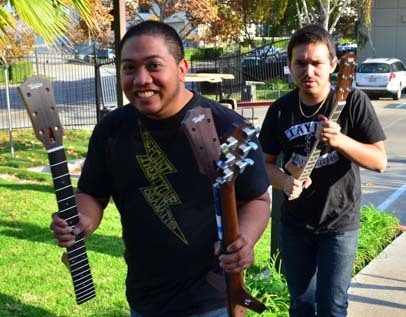 After graduation, he was hired by the guitar manufacturer American Dream, and shortly after that he bought the company with two other kids as partners! Gosh. And what were we all doing at age 18??!! Hmmm. 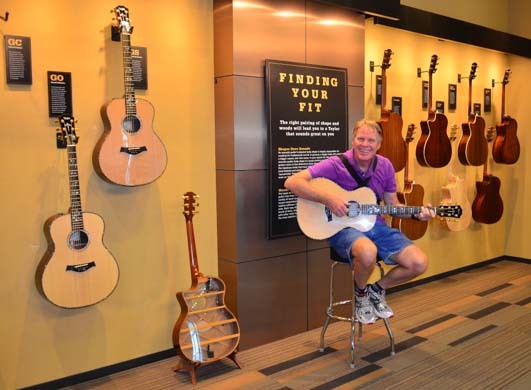 It is tales like these that make Bob’s inspiring autobiography, Guitar Lessons: A Life’s Journey Turning Passion into Business jump to life on every page. He absolutely loves building guitars. This doesn’t seem very earth shattering, but he goes on to to make an intriguing comparison between marriage and careers. He talks about what love is, and how love is the chariot that holds two people together and carries them through the ups and downs that go into creating a successful marriage. Well, that romantic visual is actually mine, but I think it paints a vivid picture of what he means. Passion is at the heart of success. In this same way, he says, loving what you do — being totally passionate about you daily activities — is what will carry you through the trials and tribulations of creating a successful career. When things got really bad financially at Taylor Guitars (which they did frequently during his first 10 years in business), he found his peace and inspiration when he was in his shop with his wood and tools in hand as he created a beautiful new guitar. He often worked til midnight and sometimes worked overnight, but the hours melted away and he was in his own happy world when his hands were bringing a guitar to life. In his first year in business, 1974, Bob’s young company built and sold six guitars. Neither he nor his two partners took a salary for the first three years, and then they paid themselves just $15 a week. Guitar building is all about wood! They gradually raised their pay to $85 a week, but often couldn’t cash their own paychecks! Today, he and Kurt Listug, the partner with whom he now splits ownership of Taylor Guitars, have factories in both El Cajon, California, and Tecate, Mexico. 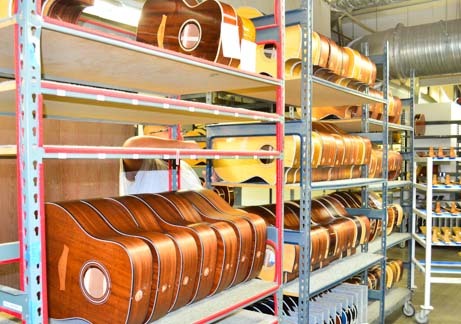 They employ 700 people and turn out 480-500 guitars a day. Wow! Passion pays off! As our tour headed out of the visitors center, we passed by several sheds housing piles of wood. 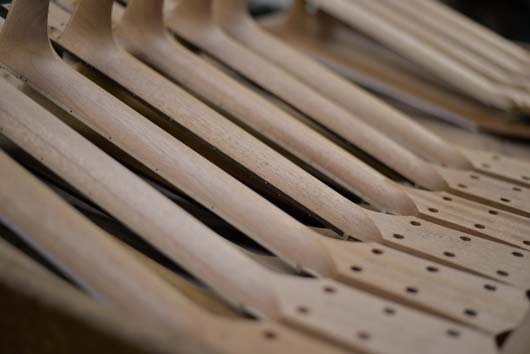 I hadn’t really thought much before we got there about what a guitar factory would look like, but it quickly became apparent that the very heart of guitar manufacturing is wood. Exotic wood, beautiful wood, wood that produces rich musical tones. Wood that doesn’t grow on the lot next door. Indeed, as Bob Taylor has guided his company from being a kid business to being a big, successful and mature corporation, his own personal focus has shifted from making guitars with his own hands to designing jigs and machines and clever laser-cutting and computer-driven manufacturing tools, to going out into the forests of third world countries to figure out how to ensure the supply of rare woods remains plentiful for the guitar industry as long as possible. This has taken him into remote villages in places like Honduras, India and Cameroon where he now works with the locals to help them manage and profit from their own natural resources. Back in those early, jittery days of getting his company to a point where it could pay him a salary, would Bob have ever guessed that decades later his primary focus would be figuring out how to keep his raw materials available in the most remote rainforests of the world? Would he have ever thought that one day he could trace the source of many of the planks of wood in his factory back to the stumps they came from? Today he can, and he does. What an amazing journey Bob Taylor’s life has been. The mahogany he uses comes from three families in a remote village in Honduras. It is packed onto mules and carried around the rugged mountains to where it can be loaded onto trucks for shipment to California. 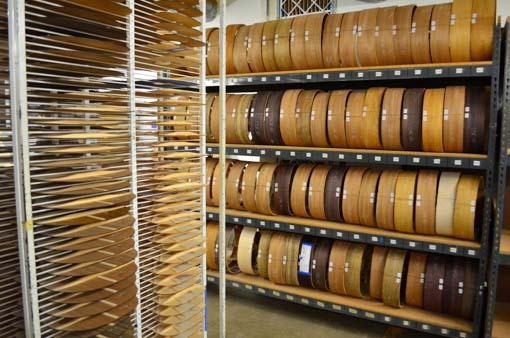 Taylor Guitars uses four to six mahogany trees per year. One tree can generate 10,000 to 40,000 guitars. Mahogany is also available in Fiji where the English planted it 100 years ago. 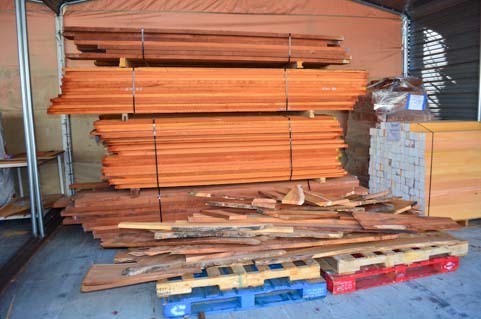 But there are disagreements about ownership coming down through the generations that have made it very complicated to obtain, so Honduras is a better source for mahogany. 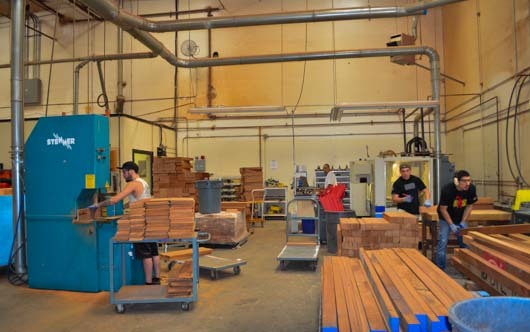 Koa wood comes from elevations higher than 5000′ on the mountains of Hawaii’s Big Island. 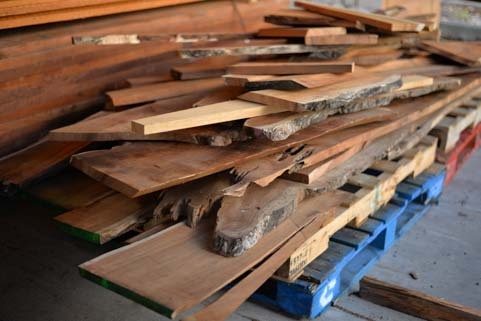 Rosewood comes from an east Indian family Bob Taylor has worked with for decades. Even though this stuff grows on trees — this stuff IS trees — it sure isn’t easy to get! The rosewood of choice for guitars used to come from Brazil, and at one time he could buy it for $2 a foot. Now it is so rare it costs thousands of dollars a foot. 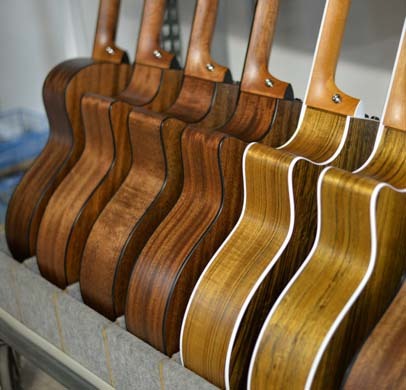 Brazilian rosewood was Bob’s wake-up call that these special woods needed to be sourced, managed and controlled very carefully. The most impressive wood story lies behind the ebony wood that is used for the fingerboard of just about every guitar (and violin, viola, cello and other stringed instruments) in the world. It comes from Cameroon in west central Africa (next to Nigeria and Chad), a largely impoverished area that has 85% unemployment. When Bob visited, he discovered that the wood is not typically solid black but is usually striated with light and dark colored stripes. Of course, there is no way of knowing, by looking at a standing tree, whether the wood inside is striped or solid black, until it is cut down. So, the woodcutters would chop down a tree, check it out, and then go on to the next tree if this one wasn’t solid black on the inside. Unfortunately, nine out of ten ebony trees had striated wood and were being left to rot on the ground. Bob was shocked at this senseless waste of great wood. 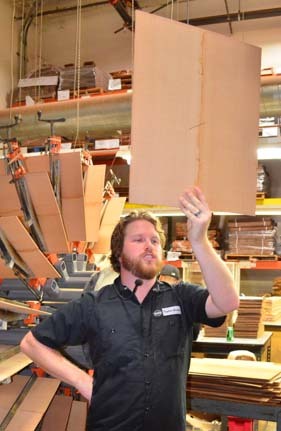 The qualities that make ebony ideal for fingerboards have nothing to do with the color! What to do? Roll up your sleeves and get right in there! Taylor Guitars formed a partnership to buy the mill in Cameroon. Then they installed electric transformers to provide the mill with electricity (the saws had been gas-powered). Then they doubled the pay of all the workers. Most important, he insisted the woodcutters mill ALL the ebony trees they cut down rather than just the ones with the solid black wood inside. His partnership is now the largest ebony supplier in the world and has become the sole source of ebony, not only for most of the guitar industry but for the entire violin industry as well. The best part of all this is that by controlling so much of the ebony market, he has been able to decree to the stringed instrument industry that from here on out, striated ebony is what’s on tap. It is now up to all the manufacturers to make that coloration fashionable. Otherwise, the forests will be overcut and there will be no ebony of any kind left for anyone at all. Yet being the primary source of ebony in the world is hardly a gravy train to riches. Instead, it is Bob’s way of ensuring that this rare natural resource is harvested sustainably. There are many human links between the harvested trees in Cameroon and the pallets of wood that arrive at the receiving dock of a corporation. 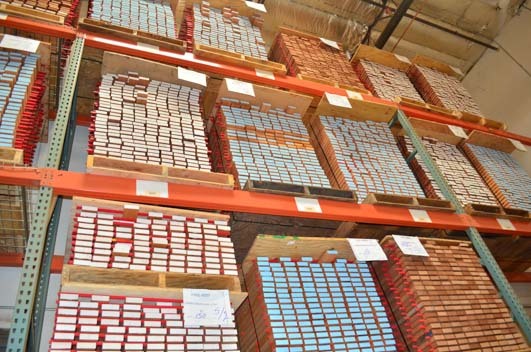 Ebony shipments are often hopelessly delayed by individuals and groups in the chain who demand bribes to release the shipment to the next level. However, Taylor’s employees in Africa are instructed not to accept bribes and to conduct business in an above-board manner. So, sometimes they have to sit and wait for days until they outwait the entities demanding the bribes. Of course, all this slows the delivery schedule by months. Clearly, the cost of making this ebony supply business work can easily outweigh the profits. I’m sure there are days when Bob wishes he could just grow a stand of ebony trees (not to mention all his other exotic wood) out on the back lot! All this talk about sourcing and eco-sustainability was cool, but weren’t we here to see how guitars are made too?? Of course! 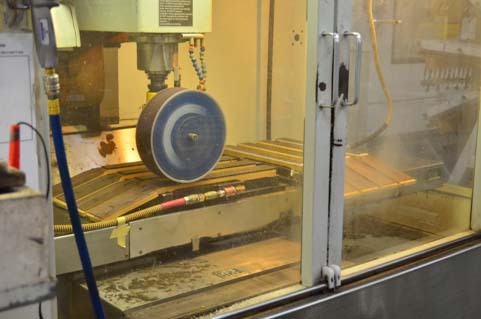 And we saw one machine after another that Bob and his team of engineers have invented for manufacturing guitars as efficiently as possible. There were innovations everywhere. 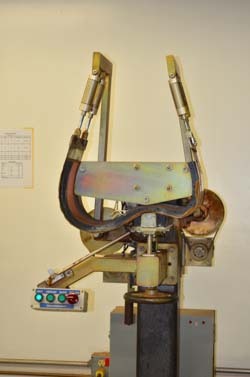 Each step of the manufacturing process has been refined repeatedly over the years, mostly in an all-out effort to reduce costs dating back to the time when the company had no market share and lacked the wide-spread reputation for quality and desirability that would allow them to raise prices without losing customers. 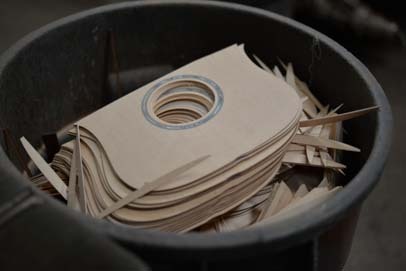 Guitar backs are made of paper thin sheets of wood that have been filleted and placed side-by-side to form a mirror to each other. Then they are dehydrated, rehydrated and glued together, and then hung out to dry on Bob-designed carousels. The neck assembly is actually revolutionary twice over: first for having a bolt-on design rather than a traditional dove-tail glued-on joint that was impossible to repair down the road (Bob came up with this idea as a kid while working at American Dream), and second for being cut in such a way that the most necks can be made from the least possible amount of wood. Perhaps the most engaging thing about this company, though, besides its eco-sustainable sourcing and its innovative engineering, is the youthful and energetic corporate culture. 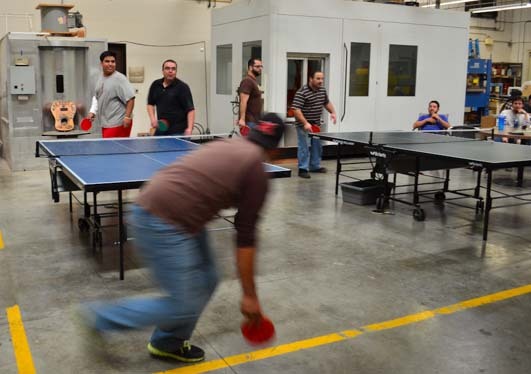 Tattoos, piercings and low slung pants are definitely the fashion of choice among the employees, and an enthusiastic series of ping-pong games broke out during lunch break on one side of the factory floor while we were there. We felt like we were visiting a Silicon Valley electronics company. 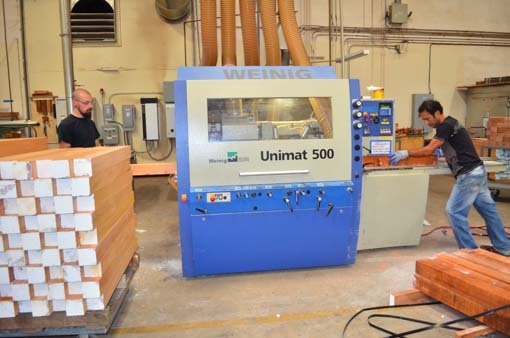 What impressed me most, though, is that even though some of the jobs seemed hopeleslly monotonous — stamping frets into fret boards or shoving planks through a saw, for instance — everyone seemed excited about their work and was moving fast. There didn’t seem to be any room in this factory for boredom or complaining. 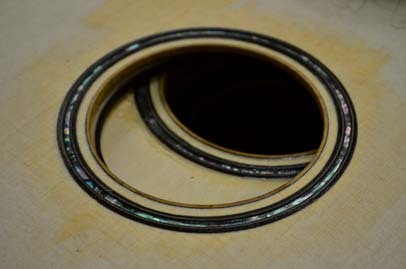 Besides the source wood, another critical component of a guitar is the sea shells used to decorate the sound hole and fret board. Back when he first started, Bob went diving in nearby La Jolla to collect the mother-of-pearl he used on his guitars. Those days are long gone, and today the abalone is farmed in Australia and comes in little sets of pieces. 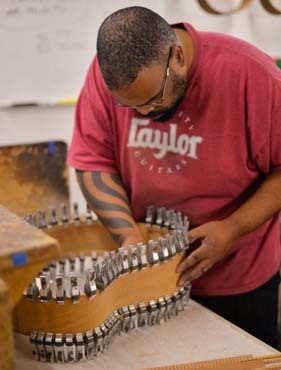 Of course, the highest end guitars get very elaborate and beautiful abalone and exotic wood inlays, and the workers use dental tools to put them in place. We saw a few gorgeous examples. All of the machines were impressive, but perhaps my favorite was the side bending machine. The sides of a guitar have to be bent into that hourglass shape, and it used to take several days. First the wood was soaked for 24 hours and then it was slowly bent to the sharp angles. One in four boards broke while they were being bent. 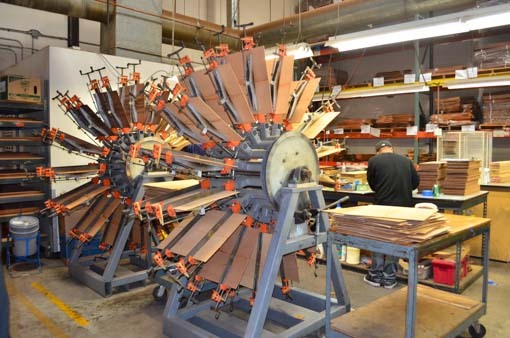 Today, a slick machine heats the wood and utilizes the interior moisture of the wood itself to bend it. In just a minute or two we watched a perfectly straight board get bent to form the curvy side of a guitar, as if it were a piece of soft plastic. Magic! 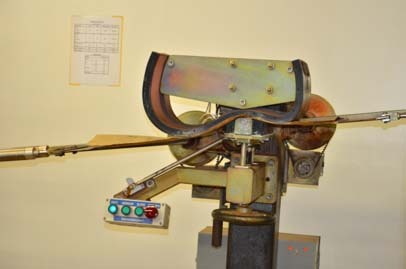 Not all the guitars are bent on this machine, and we watched a few getting clamped in place using the old method. 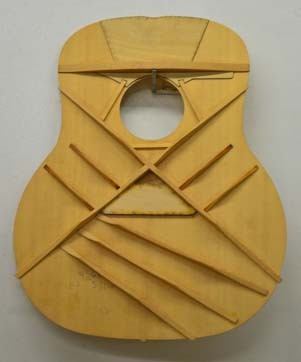 Once the sides are formed and joined together, the back and soundboard of the guitar can be attached. It turns out that the soundboard of a guitar is reinforced by a pattern of braces that strengthen it against the pull of the metal strings on the neck. Those strings exert a force of 160 lbs, and Bob learned early on that, without braces, a guitar explodes apart when you tune it! We discovered that Bob actually really liked explosives and exploding things in his youth. He was partial to fireworks and dramatic destruction, and was also an extreme perfectionist. One day, after he felt he had gotten his company successfully off the ground, he picked up a few of the first guitars he had made and looked at them with disdain. They seemed amateurish to him now. Rather than hang onto these less-than-perfect guitars that so glaringly revealed the steep learning curve he had climbed to achieve mastery of his craft, he decided to do each one of them in. He dropped a cherry bomb into the sound hole of one guitar, and blew it to smithereens with a massive twang. He laid another on the ground and then lit up his back motorcycle tire on top of it in a wild-eyed burnout. The guitar shot out fifteen feet behind the motorcycle and splintered into a million pieces. Of course today those guitars would be worth a lot of money as museum pieces, but he had no idea he would grow up to be rich and famous and admired by guitar lovers worldwide! 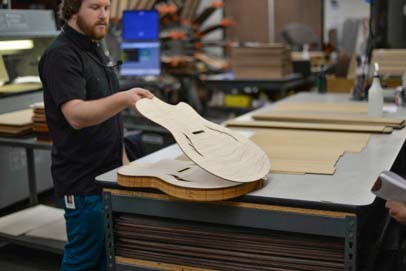 Part of what makes Bob’s guitars and company so unique is the endless stream of innovation that has been at the core of the company since the beginning, right down to the satin and glossy finishes that make each guitar glow. The edges of the guitar get shaped. 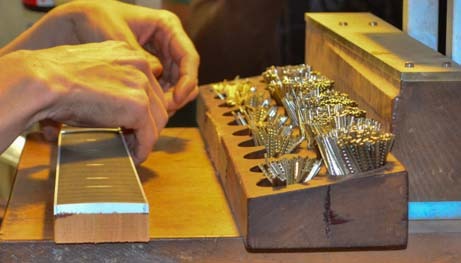 The finish on a guitar needs to be as thin as possible so it doesn’t interfere with the acoustic qualities of the wood. 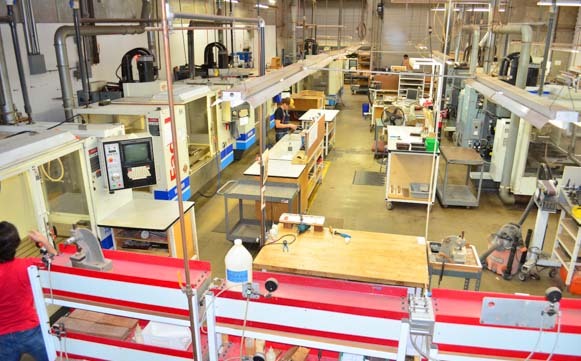 So, rather than a traditionally applied finish, robots apply the finish electrostatically in a paintbooth, like a car. Taking a page from modern dentistry, the finish is then cured using ultraviolet light. It was also full of wonder at how a humble musical instrument could become the muse for such a complex, successful and happy corporation. The guitar was embraced by a whole generation of baby boom hippies, but for one man it spawned dreams that went far beyond mere chords and song. 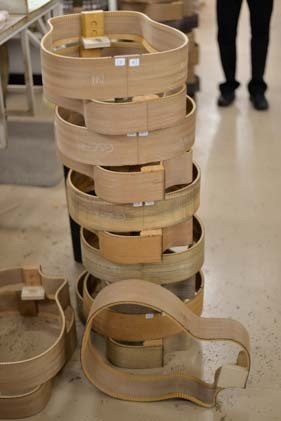 This simple wooden box, with strings attached, first sent Bob to the drawing board to design not only the guitars themselves but the elaborate automation machinery needed to build them efficiently. Once all that was accomplished, this instrument that dates back several thousand years then sent Bob on a worldwide tour to find, and ultimately to protect, the natural materials that go into making them. 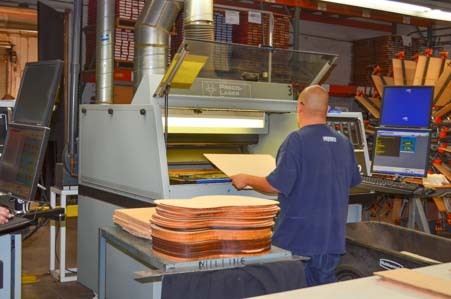 480-500 guitars are completed each day. But the Taylor story goes so much deeper than that. I felt like we came to the factory to see how guitars are made, but we left having been taught something about world ecology, rainforests, and what it will take for future entrepreneurs to ensure that the raw materials they use in their products are preserved. More importantly, we saw first-hand what can happen if you build your life around what you truly love and what makes you passionate and what makes you happy to be alive. Now that’s a great guitar lesson, and it is one we will carry close to our hearts as we make our way into the next phase of our own full-time traveling lifestyle! Here is a handy link to Bob Taylor’s autobiography (both hard cover and kindle editions at Amazon), which we both really enjoyed. If you buy it here a few cents roll our way (thanks!). He wrote another book commemorating the company’s first 30 years which is available at the visitors center, and it is excellent as well. This entry was posted in California and tagged California, California San Diego, New, Travel, USA, WP Travel by Roads Less Traveled. Bookmark the permalink.